The 2018-2019 federal duck stamp goes on sale Friday, June 29. The stamps, which cost $25, are valid from July 1 through June 30, 2019. Purchased by millions of waterfowl hunters, wildlife enthusiasts and collectors every year, duck stamps help raise money to purchase and protect wetlands for ducks, geese and other wildlife species. The federal duck stamp is a powerful tool for conservation in the United States. Every year the program raises more than $38 million used to purchase and protect wetlands in the National Wildlife Refuge System. These habitats benefit waterfowl and numerous other species of wildlife. The artwork for the 2018-2019 stamp was created by Bob Hautman, an artist from Delano, Minnesota. His painting features a pair of mallards. This is Hautman’s third federal duck stamp contest win. 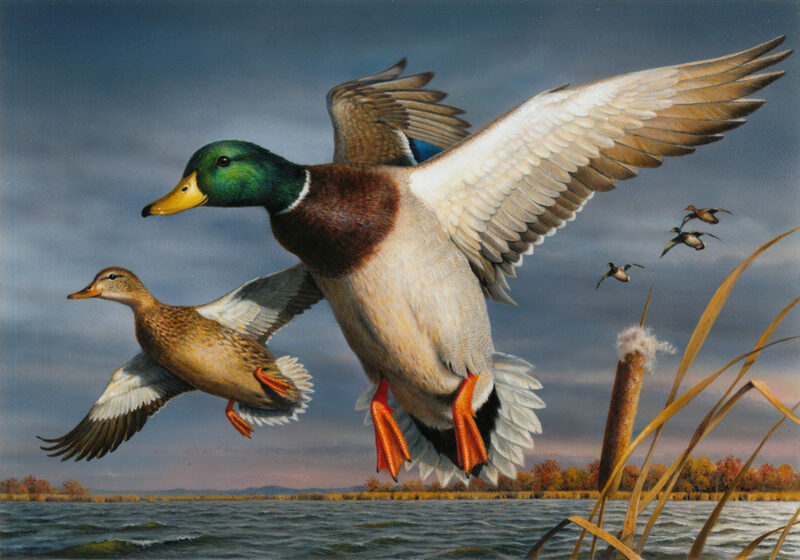 His art previously appeared on the 1997-1998 and 2001-2002 federal duck stamps. A recent Ducks Unlimited online film joined the Hautman brothers on a special waterfowling trip to North Dakota. Joe, Jim and Bob Hautman are renowned wildlife artists and perennial winners of the federal duck stamp contest. Watch the film at www.ducks.org/dufilms. This year’s junior duck stamp features an acrylic painting of an emperor goose, painted by Rayen Kang of John’s Creek, Georgia. More than 3,000 junior duck stamps are sold annually for $5 each to help promote conservation education through art. The duck stamp, also known as the Migratory Bird Hunting and Conservation Stamp, dates back to 1934. Since then, the program has raised more than $1 billion to help acquire and protect more than 6 million acres of habitat in the National Wildlife Refuge System. Waterfowl hunters age 16 and older are required to purchase and carry a duck stamp while hunting. A duck stamp also provides free admission to national wildlife refuges (NWRs) that are open to the public. Duck stamps are sold at post offices nationwide and at many NWRs and sporting goods stores. Electronic versions of the duck stamp can also be purchased online.